Read the review of DVDFab DVD Copy software, what this software is capable of and how it can help you make backup of your premium disc data. DVDFab DVD Copy is a DVD copying tool that is quite famous for its high speed cloning work within 2-3 steps and for the range of output customization tools it offers. Let's see what makes it such a famous software for DVD cloning. DVD copy can not only make clones of DVD to another DVD but can also copy the content in it to another folder or make an ISO of it to store on the hard drive. You can even compress the DVD size to fit it on a DVD having lesser space. Some discs are protected with copyright-protection programs so that you are not able to copy files from it normally, but legally you can make a copy of these files to serve as a backup in case you lose the original disc due to theft or accidental damage. Full Disc - As the name suggests, this makes a clone of the whole disc. Main Movie - Usually a disc containing a movie will contain a number of files which will be a small cut-scene from the movie, a info files and the whole movie file. Main Movie feature will go through the list of files and will copy only the largest multimedia file saving the space on your hard drive. Merge - This allows you to get multiple files and merge them in a single DVD. Split - Split mode copied a DVD-9 files into two DVD-5 files. 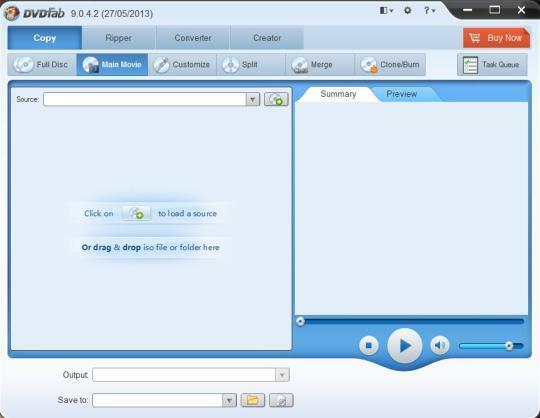 Clone/Burn - This feature allows you to make an exact copy of your original DVD. This mode does no compression and the output will be saved in the same file size. Customize - This mode allows you to personalize you DVD output file in many ways. You can remove part of DVD files, select some particular chapters to copy, make your own playlist and select the default launage of the movie file if it has dual audio. Copy in 1:1 ratio or with compression. This means that you can copy your DVD-9 file to DVD-9 or DVD-5 to DVD-5 file, otherwise you can also copy a DVD-9 file to DVD-5 or DVD-5 file to DVD-90. Pre-select the audio or subtitles to play with a video. Detailed progress report is shown to you while copying and you can use the preview screen to see and head the video before the completion is finish to check for any customization issues. For a noob user this offers an extremely easy interface to do the copying within a click of few buttons and for advanced users it offers a lot of customization tools to get the necessary changes you need. DVDFab DVD copy software is a very niche product and therefore is quite a powerful one. It has easy interface and supports multiple languages therefore making it useful for users from a number of countries. Preview screen is a very useful feature to check for any set up errors and correct them at without wasting time waiting for the while movie to be copied. It has been designed keeping it mind both novice and advanced users. It has been designed even to give the best results when copying from an already damaged file. Depending on the hardware you are using, DVDFab DVD Copy will get whatever data it can from a damaged disc. Easy to use interface. Few click operation and quite fast. Advanced customization tools to help personalize you disc output. Error recovery tools to recover data from a damaged disc. Can copy even copyright-protected DVDs. Has a good track record of performance. In spite of my best effort I could not find a flaw to mention here. This software is indeed a boon for those who want to make copies of their personal DVDs. Hopefully, pirated CD makers don't use these kind of great software for their own gains.